(NaturalNews) As pharmaceuticals change people's natural physiology, they leave damaging effects in both the short and long term. Drugs that reduce acid reflux, such as Prilosec, Zegerid and Prevacid, systematically raise one's blood pressure, and, according to new research, damage the health of the kidneys. John Hopkins University found a 15 percent increase in chronic kidney disease over a 10 year span for those who used these drugs. These proton pump inhibitor (PPI) pills work by blocking the natural enzymes in stomach acid. As a result, a person's enzymes are reduced to just 10 percent of their normal levels. (Stomach acid is essential for protecting the gut from infectious pathogens.) With continued use of PPI's, a person hinders their body's ability to assimilate vital nutrients, thus becoming more prone to infection and nutrient deficiencies. Previous studies point out that PPIs increase a person's risk of contracting deadly infection C. difficile. It's obvious that PPIs destabilize the healthy microbial organisms in the gut. One major 10-year study published in the British Medical Journal in 2011, found that these drugs put users at a 20 percent greater risk of heart attack. Scientists at Houston Methodist Hospital found that these drugs deplete supplies of nitric oxide in the body. Nitric oxide helps relax the blood vessels, explaining the pills' high blood pressure connection. The burning sensation of acid reflux, although irritating, is not something that should be physiologically suppressed, causing further damage to the body. Acid reflux is a signal that the digestive system is not working properly. It's a signal that the foods going into the body are a burden to the body. People who suffer from acid reflux are eating greasy, processed fast foods that the body is simply rejecting. To find relief from acid reflux long term, changes have to be made to the quality of food in the diet. Some of the best foods that help settle acid reflux are ginger root, apple cider vinegar and activated charcoal. Unlike PPI pills, ginger root relieves nausea and calms the stomach, while also benefiting vitamin assimilation and kidney health. Just don't expect the medical doctor to prescribe ginger root the next time you tell him about acid reflux. In England alone, there were 53 million prescriptions for PPIs in 2014, clearly demonstrating that the medical profession is absolutely clueless about the dietary needs of individuals, and the health benefits of something as simple as ginger root. The National Institute for Health and Care Excellence (NICE) instructs doctors to prescribe PPIs for acid reflux and peptic ulcers, and the doctors just go along and follow protocol, never seeing what these drugs are doing to patients long term. Doctors hardly ever stop and think about what a 90 percent reduction in stomach acid could be doing to their patients' ability to fight off infection or utilize nutrients. 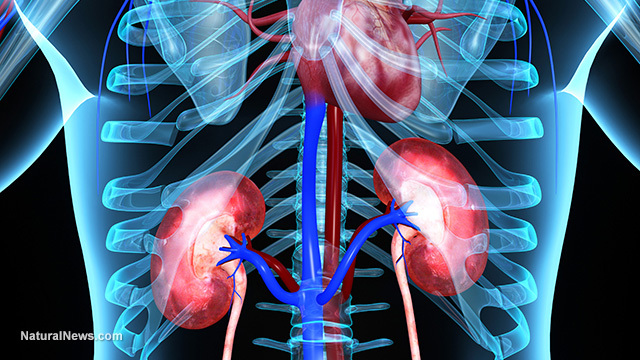 The newest research linking PPIs to kidney damage was conducted at Johns Hopkins University in Baltimore, Maryland. For 14 years, researchers tracked thousands of patients with cardiovascular disease. As patients got hooked on the bad science of these PPIs, over ten years their risk of developing chronic kidney disease went up by 15 percent. Many of these patients ended up in hospital beds. Studies show that 46 percent of all hospital patients are on PPIs. Tim Spector, gastroenterologist at King's College London, documented changes in gut, mouth and nose bacteria when patients were on PPIs. The bacteria that cause infections increased in the mouth and nose areas, while the beneficial bacteria in the gut decreased in number when PPIs were taken. "These microbes have a much more important role in human health than previously thought," says Professor Spector. It's this imbalance of beneficial gut microbes that has been linked to all sorts of health problems, including kidney disease. PPIs also limit the body's ability to use calcium, therefore weakening the kidneys and ultimately the bones. There's really no reason to take PPIs for acid reflux if a person is willing to make changes in what they eat. Otherwise, these acid reflux inhibitors are going to destroy the health of the microbiome, weakening a person's ability to use nutrition, fight infection, and even maintain strong bones and kidney health.